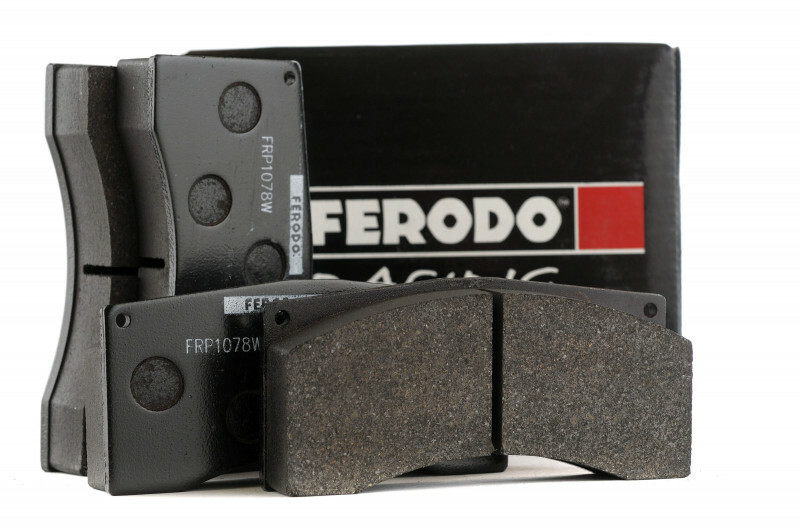 Ferodo FRP3120H DS2500 Brake Pads | Essex Parts Services, Inc. Although we always recommend using a dedicated race pad for the track, the DS2500 is one of the best hybrid street/track pads on the market. It features the moderately high bite and solid fade resistance of a track pad, with the relatively low dust and noise levels of a street pad. When used as a street pad, it can produce some squeal on certain vehicle platforms. During aggressive driving the DS2500 is known for its flat torque curve, which means as temperatures go up, the response through the brake pedal remains consistent. If you drive aggressively on the street, do some canyon runs, autoX, and maybe some light track duty on street tires, the DS2500 is tough to beat. 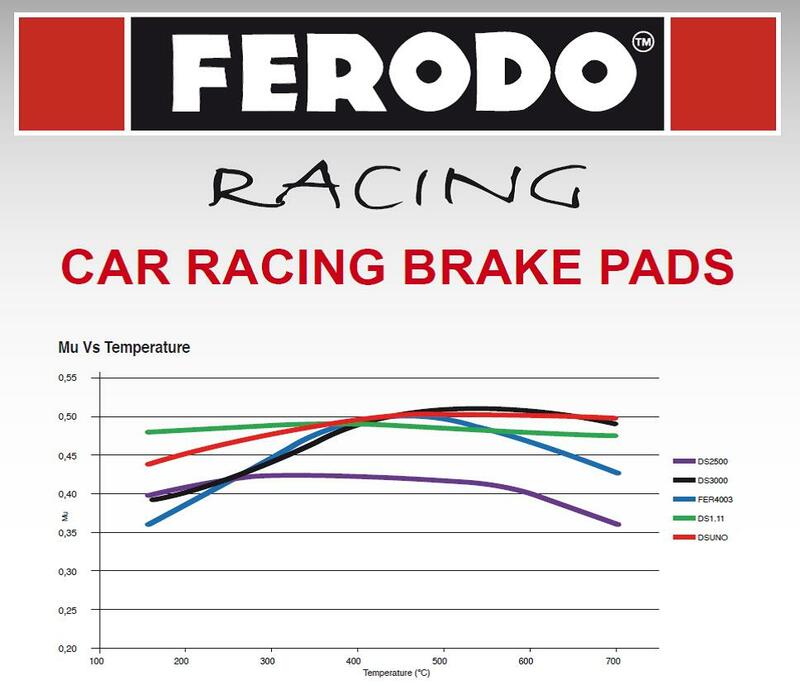 When used on high HP, heavier cars (2,800 lbs+) on the track with race tires, pad wear rates tend to be higher than on Ferodo Racing's other pad compounds. Under those conditions, Essex would recommend the Ferodo DS1.11 or DSUNO. The DS1.11 is one of Ferodo Racing's latest endurance race pad offerings. It has slightly less bite at high temps. vs their older DS3000, but doesn't decompose nearly as quickly under extended heavy use on the track. The DS1.11 is known for its extremely flat torque curve, which means that as temperatures go up, the response through the brake pedal remains consistent. The DS1.11 can be thrashed all day without having it burn up or fade, it's easy on discs, and doesn't have many of the judder or vibration issues that competing products have. If you want an extremely solid, all around race pad that will perform well and last a long time, the DS1.11 is the perfect choice. Ferodo Racing has made great strides in pad development over the past few years, and DSUNO is their latest offering. For our customers who enjoy the performance of the DS1.11, but just want a little more bite, we recommend the DSUNO. It doesn't wear quite as long as the DS1.11, but it does offer a higher overall mu once it reaches track temperatures. DS3000 as been Ferodo's most popular racing compound since 1998. The predecessor to DS1.11, DS3000 offers high initial bite with excellent feel and release. Popular among rally teams, DS3000 has a relatively low cold temperature threshold while still offering high temp stability for tarmac. DS3000 is very easy on discs at the expense of pad wear. 4003 is a compound that was specifically developed for lighter cars (Formula 3, Formula Ford, Formula VW, Formula Renault, Formula Campus) and occasionally for Rally use. It features a short bed-in time, good inital bite, low drag and excellent release characteristics. 4003 is only available in a few select shapes.